Eastern religions like Hinduism and Buddhism have their unique beliefs in reincarnation. There is a recent story in Cambodia about a 74-year-old woman named Khim Hang and a cow. Khim Hang believes that the young calf is actually the reincarnation of her dead husband. They are happily married now and living together in Kratie Cambodia. Tol Khut her husband died a year ago and it broke the heart of Khim. Having survived the genocide from 1975-1979 they went through a lot of hardships in life through thick and thin. Earlier this July, a young calf was born and it started to exhibit traits of Tol Khut. The calf was described to be more emphatic towards them and act more 'human'. The calf's action made Khim believe that her husband's soul found it's sheltered on a young calf's body. At their wedding ceremony, several people were invited to witness one of the most bizarre exchanges of vows. 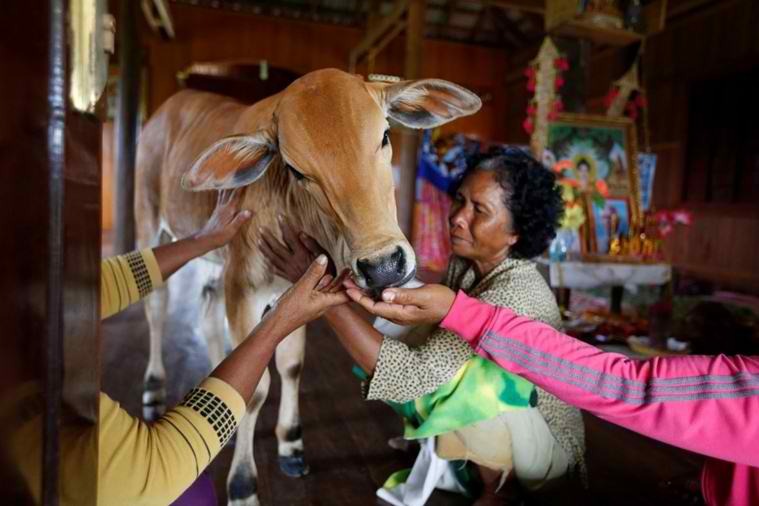 Khim's belief that her husband is reincarnated as a cow is not frowned upon by Cambodians. More than 90% of Cambodians are Buddhists and firmly believe in reincarnation.